After long time sharing a mutton recipe here in RJ. Today's recipe is from Mughlai cuisine, which we usually eat in a North Indian restaurant. 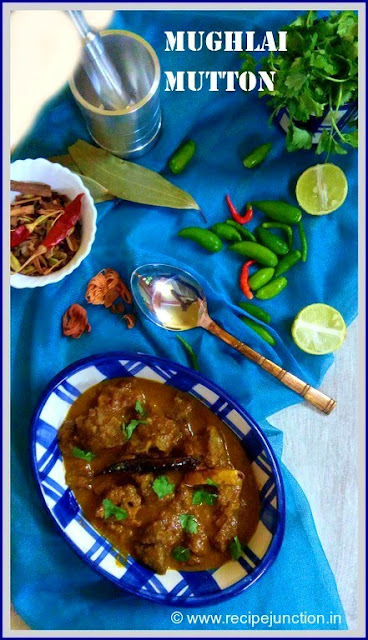 Usually, at home I make mutton in Bengali style and I love it with rice. But sometimes, when I crave mutton curries to have with naan/paratha, I prefer this Mughlai style mutton curry. 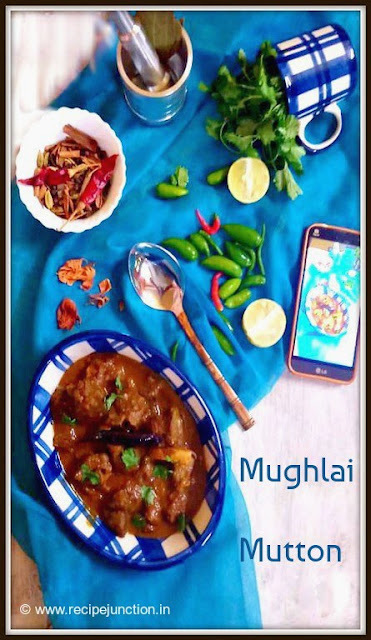 This recipe is not overloaded with spices, only marinated with ginger-garlic paste and salt and then slow-cooked with very little basic spices to give it a royal and exotic touch of Mughlai cuisine. It goes very well with roti or naan or parathas but equally tastes great with light pulao or Jeera rice as well. Any mutton preparation tastes best when it is slow-cooked on stove-top. 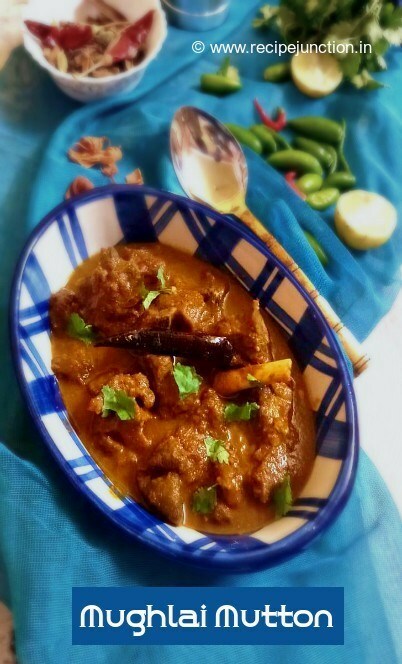 As mutton takes quite a lot of time to cook, you can also use a pressure cooker to cook the mutton when you are in hurry. For special occassions, I prefer to cook it on stove-top on slow heat. Mustard/Vegetable Oil : 3 tblsp. Shah Jeera : 1 tsp. Poppy Seeds : 1 and 1/2 tblsp. Melon Seeds : 2 tsp. Marinate the mutton pieces with little salt, 1 tsp each of ginger and garlic paste and 1 tblsp. curd/yogurt. Keep aside for at least 1-2 hours. Even more is merrier. If your are making fried onion or beresta at home, then heat 3 tblps. oil in a pan, heat well and then fry 2 thinly sliced onion until they are crisp and brown. Remove, drain on paper towel and let it cool. Prepare it well ahead and let it cool completely. You can also use the store-bought one. Yes, nowadays it is available in some grocery stores. After meat is well marinated, heat 3 tblsp. oil, temper the oil with cloves, black peppercorns, green cardamom, javitri, bay leaf, cinnamon stick and lastly shah jeera, let the aroma come out, do not let them burn. immediately add onion paste. Keep stirring and sauteing till paste change color, add ginger-garlic paste and add the marinated mutton. Saute with continuous stirring for 4-5 minutes till meat change a little color. Add the grounded spice paste using the ingredients listed under ‘Spices to make a paste’. and yogurt. Mix well and season with salt and sugar. Keep cooking for 4-5 minutes. Then add about 2 cups of water and transfer it to a pressure cooker. Cook till mutton cooks completely. Remove from heat and let the cooker rest for 1/ 2 an hour. Then open the cooker and sprinkle some garam masala from top. Mix and serve immediately. If you have tried any of my recipe, share with me by clicking a pic and mail me. Please give your thought also with that if you have liked it or not.